Because being a mad scientist is too da!n expensive. Yes, it’s faded. I took this pic from a projection standing about 50ft away. Good fortune has smiled upon me. My company offered to send me to DEFCON 25, flight and hotel paid. In this article, I’ll talk about DEFCON 25, the sights, the sounds, and my experiences of a hardware geek gone to the world-renowned hacker mecca. 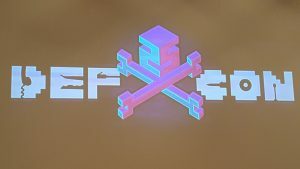 If you have ever wanted to go to DEFCON but aren’t quite sure what to expect, I have provided a summary of the trip as well as an important “FNG TIPS” list of things you want to be aware of before you leave. Welcome to YourWarrantyIsVoid.com where I post articles and document some of the interesting things that I experience while I continue to learn about computers, hardware and electronics. This site is 100% User Content generated so each article here was created by a human (namely me) for you humans to read and enjoy. There's no auto-poster or spamvertisements or any scripted mess here. If you like an article or want to share your own experiences, please feel free to leave a comment on the article. I love hearing what you have to say. Cruising with WiFi – Is that a travel router in your pocket?